August. The month of heat, 10,000 back to school posts and rain. It has rained every day for the last 45 days here in Florida, to a point that it’s iffy whether we will have working toilets. The heat index averages 108 and the humidity hovers around 98%. This place is miserable and makes me question why any sane person would ever move to Florida. I don’t say this for the month of February. 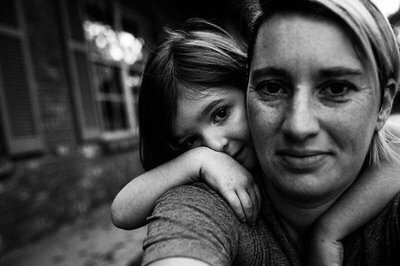 Anywho, for this months project, I want to talk about documenting family. It’s kinda funny but in general the images, I feel the most anxiety about taking are ones of my family. Not my kids (obviously), but my parents, my grandparents, my in-laws. It’s not that I don’t want those images, but I feel like I am intruding to get them like I can’t be their daughter and their photographer. It’s weird, I know. I know part of it is that when we are together we are often sitting around the table talking, I am also trying to parent and my kids are going through the pantry looking for the hidden cookies they know Great Grandma has in there. So when I caught this moment, a moment that I spent lots of time at when I was a kid, it gave me a free chance to play the role of photographer and not mom. I remember helping wash the car when I was these kids age, then it became my job to scrub the top of the 1972 VW van when I got older. I remember the lectures from my father of not keeping my truck clean once I was old enough to drive and the luck of my dad scrubbing it when I went to visit. These are vivid memories to me. Here is my dad and my children, washing the truck. I hope my children have such fond memories of my dad as I do. He is a hell of a good guy and they are pretty darn lucky he is still around. Guess what I can be the documentarian for your family. Contact me today! But wait, these are only 4 images (umm, hello 5 pictures on the 5th). So here is my latest selfie. This is about the extent of selfies for now. Let’s just say I’m feeling the camera these days. Now GO check out Margaret Albaugh Photography and her fabulous trip to the river with her kids for this month! this is so perfect. takes me right back to the days of helping my mom wash our car at the car wash. <3 these memories are perfect. They did a great job! They’ll need to start charging soon!